Equipment: satellite TV; washing machine; gas central heating. Feature: Property in a two-family property (max. 3 floor(s), 2 units in total). village house. Please note: No internal connecting door between the separated properties. Apartment without front door. Permanent tenant lives in the house. apartment, 2 - 4 people, 2 room/s, 1 bedroom/s, 1 bathroom/s, approx. 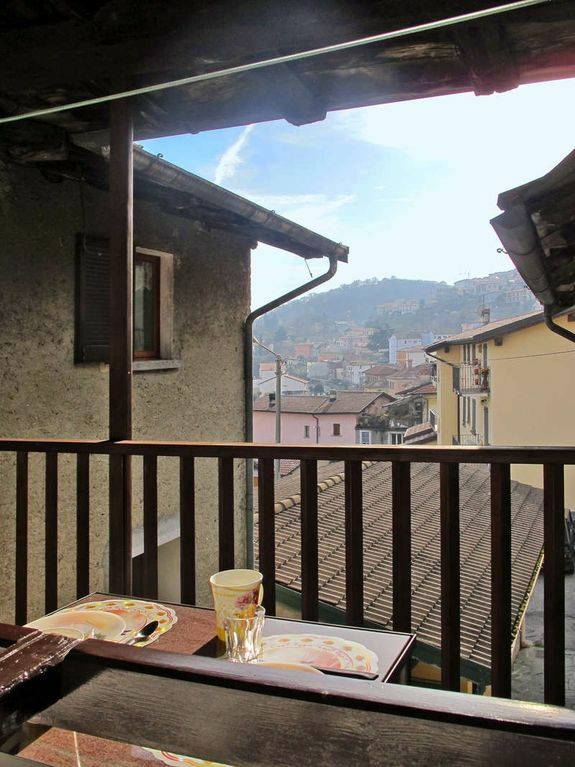 55 m², 1 floor/s, apartment on floor 2, 19. century, renovated 2015, separate access to the property, via external stairs. Bedroom 1: (room with external access only): double bed, single bed, exit to balcony. Dining area: (chairs, corner bench) in the kitchen. Kitchen: Kitchen/ cooking equipment: 4 gas rings, oven, microwave oven, combination fridge-freezer, coffee machine, water boiler, toaster. open to the living room. Living room/bed room: sofa, sleeping chair, fireplace (only for decoration), exit to balcony. Sanitary 1: (floor 1, room with external access only): bath, WC. Access/parking: public car park approx. 20 m; public car park approx. 100 m.
Estate: On the estate dogs. Fishing: in the lake in approx. 300 m.
Situation: town centre, in the district Calozzo. Plot description: balcony (roofed), furnishing provided (chairs). Arrival: Airport Milano/Bergamo - Milano/Malpensa in approx. 99 km - 101 km. Train station Como in approx. 46 km. Beach/waters: Lake in approx. 300 m. Pebble beach in approx. 300 m.
Bus stop: Bus stop in approx. 150 m (Linea Como-Menaggio-Colico). Golf course: (18-hole golf course) in approx. 17 km (Golf Club Menaggio). Harbour/marina: Harbour/marina in approx. 750 m.
Next village/town: Center Pianello in approx. 200 m. Como in approx. 46 km. Lugano in approx. 40 km. Public swimming pool: Public outdoor swimming pool in approx. 8 km (Gravedona). Shopping: Next shopping possibility in approx. 150 m. Next supermarket in approx. 1 km.